If you're already a member of another car-sharing service, you won't want to pay twice. Our Featherweight plan makes it easy to test us out, as it has no monthly fees. Joining is free. We have no tricky contracts or minimum contract terms. If it’s not for you, just let us know and we will go our separate ways. We’re way better value than the other guys. That’s because by not having to maintain our own expensive fleet, in many cases renting our cars is around 20-40% cheaper than other car-sharing services. Our prices start at $5/hr or $25/day+ distance charges. So you can get your errands done around town for around $40 or $50, rather than shelling out closer to $100 to hire a traditional car share car for the day. Car Next Door cars live where you live; down the road, across the street, maybe even in your apartment building. Car Next Door cars are real people's cars, and so they come with real-people parking spots; convenient! Why not help your community instead of a company? 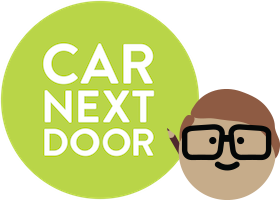 Instead of passing your money off to a corporation, when you pay for a Car Next Door car, the lion's share of that money goes to one of your neighbours. So you’re investing in your community and helping out local people, while saving money AND being green by helping keep extra cars off the road.